The Power Rangers iconic Megazord returns with a sleek Samurai look for 2011. 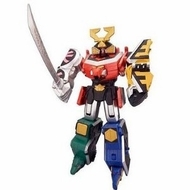 Consisting of 5 individual Zords (Lion, Dragon, Bear, Monkey and Turtle), they combine to become the almighty Megazord. A must have for both children and collectors for the past 18 years of Power Rangers history. As part of the Zordbuilder introduced in 2010, the deluxe Megazord acts as the core body to the cycles and Zord vehicles which morph into its legs and arms. Collect them all.